This roomy Amish bedside night stand is the perfect choice for someone wanting an extra large night stand. This Shaker Night Stand is available in a more rustic wormy maple wood or hard maple wood. If you are looking for another wood type such as cherry or oak then give us a call and we can provide you with pricing on this. 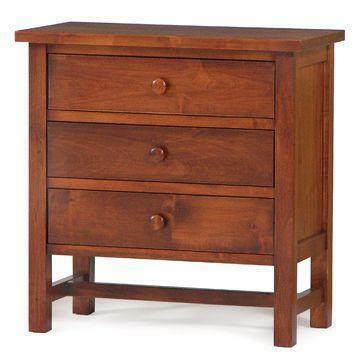 This Shaker furniture will bring a timeless style into your bedroom. This nightstand comes standard with Solid Hardwood Construction, Dovetail Drawers, Solid Wood Drawer Slides and Dust Covers Between Drawers. Choose to add full extension drawer slides or soft closing slides.